Tagging is the most important concept in ManicTime, you use it to keep track of how you spent your time. 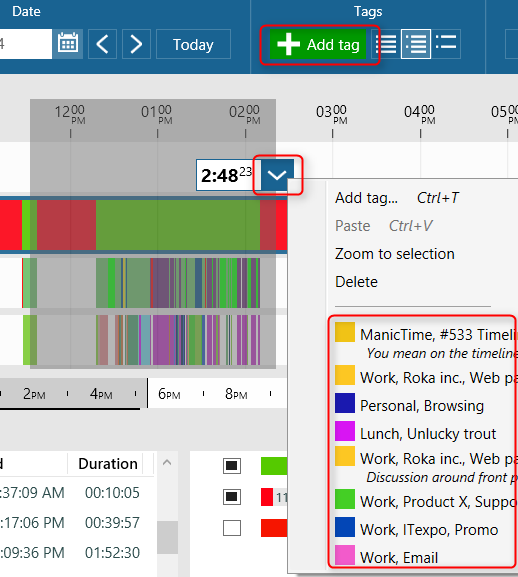 All the data ManicTime collects, should help you figure out when you were working on some task. When you want to tag some time, you must first select it. You can click on Add tag button without a selection and enter the time manually, but this is slow and inaccurate. The best way to select time in ManicTime is to drag on the timelines (hold down left mouse button while moving the mouse over the timelines). While you are moving your mouse over the timelines, you will notice a tooltip which tells you more about the underlying activity. Mouse will snap to starts and ends of activities so you can easily select whole activities. If you want your selection rounded to a minute, you can drag on the time timeline (time bar displayed just above the timelines), mouse will snap to minutes, so the final selection will be rounded to the full minute. You can also select time by checking checkboxes in the details or the summary view below the timelines. Once you select some time, click on down arrow at the end of selection or Add tag button. Before you start with tagging, take some time to think about how you want to structure tags. Imagine that tags represent your work. Our suggestion is to go from most general to the more specific ones. You can include as many tags as you want, just make sure you keep the same order, it will make things easier in the future. So if Client X is always starting tag, make sure it is always the first tag when you work for Client X. 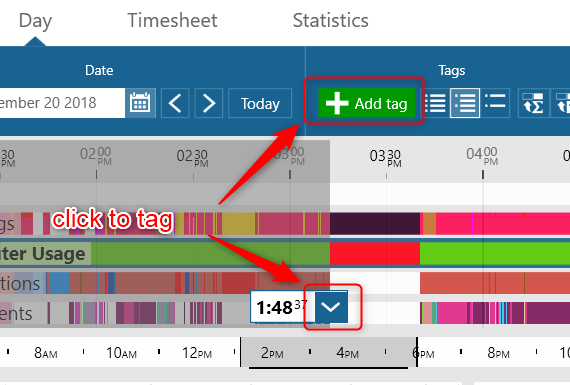 To edit a tag, right click a tag on the Tag timeline and choose Edit. To delete a tag, right click a tag on the Tag timeline and choose Delete.